In many poor, rural communities in Africa, opportunities for women to contribute financially to the family are harder to come by than for men. But Irene Yenjong Ngamngong of Ndu is an example of how that’s beginning to change. Thanks to a grassroots training program offered by the Torchbearer Foundation, Irene learned a skill that historically would have been reserved for men in her community. 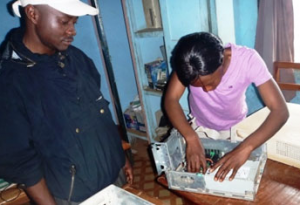 She was the first woman to complete a computer hardware assembly and repair program offered by Torchbearer. After the death of her father, Irene and her brothers and sisters helped their mother with subsistence farming to help support the family. Unfortunately, that meant she and her siblings had to drop out of school. Still the family barely made ends meet. A bright and energetic young woman, Irene decided to pursue a different path and seek out a marketable skill so she could become a productive member of society while helping support her family. She began by enrolling in Torchbearer’s software program, which she successfully completed with outstanding honors. 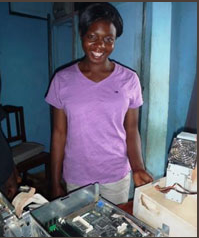 After completing that program, she continued on, training in small computer hardware maintenance. “I want women to know that what men can do, women can also do and I want to be the first lady in this locality to run a documentation shop that fully incorporates all the various components of information technology,” Irene said. Irene Yenjong Ngamngong set an example for other women to follow. Since its inception 16 years ago, Torchbearer has offered programs and training to men and women alike, regardless of age, experience or religious affiliation. That tradition continues with the School of Christian Social Entrepreneurship.